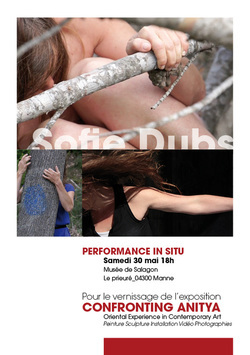 ... is the name given to various performances, improvised actions in different settings and places where Sofie may be invited. "3 hours performance of immobility - during which the public could put us" in situation "physically and / or with objects made available. Proposal made at the Museum of Archeology of Irun next to Christen, young Congolese who walked past the border of Almeria... "
Interventions in "II Jornadas de soberania alimentaria de Donostia"
"During the three days of meetings on food sovereignty, I realized In Situ performances in relation to the topics covered and the conferences given." Intervention at the opening of the exhibition "Confronting Anitya"
"Feng Ge curator of the exhibition" Confronting Anitya ", which brought together some 20 Chinese artists present at the Venice Biennale in 2010, invited me to partcipate in the opening of the exhibition. I realized a "plastic" solo performance and we proposed an improvisation In Situ with Natalie Hofmann and Marco Becherini. " "The Kontadores Cultural Center (Donostia) gave me carte blanche for a dance evening. So I invited Renata Arnedo, improvisatory dancer, to perform an improvisation of 45mn. "